Many senior adults in the United States (like their younger counterparts) don’t get enough physical activity. And that lack of physical exertion can rob seniors of a more rewarding life. While it’s true that most seniors aren’t going to “hit the gym” with the same vigor and passion that they might have in their 30s or 40s, there are still a lot of benefits to be gained from regular exercise. 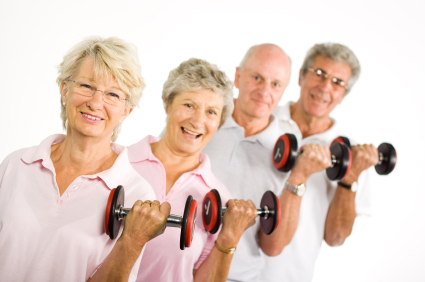 Older citizens who exercise regularly report that they feel better and enjoy life more. Regular exercise can lessen the impact of some diseases and can relieve depression. Recent research, published in the December 2010 issue of IJCP, the International Journal of Clinical Practice, confirms that regular exercise can reduce the risk of developing physical and mental health conditions— including some cancers and dementia. Obviously, seniors have unique needs when it comes to fitness and exercise. But a guide from the National Institute on Aging (NIA) suggests that even those who are frail can benefit can improve their health with moderate level exercise. The NIA lists the following for types of exercise as important for older adults. Endurance activities that increase heart rate and breathing for extended periods of time can improve the health of the heart, lungs, and circulatory system. These activities have been shown to help prevent or delay certain diseases. Strength exercises help provide older adults with the strength and stamina to keep doing both necessary activities as well as the things they enjoy doing. Balance exercises help seniors prevent falls. This is a huge benefit because falls are a major cause of disability among older adults. Stretching exercises can help keep seniors limber and flexible. This is also extremely important because just “getting going” is a significant challenge for many seniors. If you are a senior—or care for a senior, it’s important to get enough of the right kind of exercise—exercise designed to meet the unique Senior Wellness needs of aging adults. When you're looking at a retirement community make sure to ask about their excercise activities too!